Ukraine possesses a #vast #investment #potential, and #Middle East #companies have already started to #invest in the #Ukrainian #economy. Ukrainian #exporters have much more to offer, and there is no lack of interest, yet there is a lack of information on the #investment #opportunities. This spring Ukrainian companies seeking to enter new markets will have a great opportunity to showcase their goods and services at the #Ukrainian Middle East #Business #Forum. 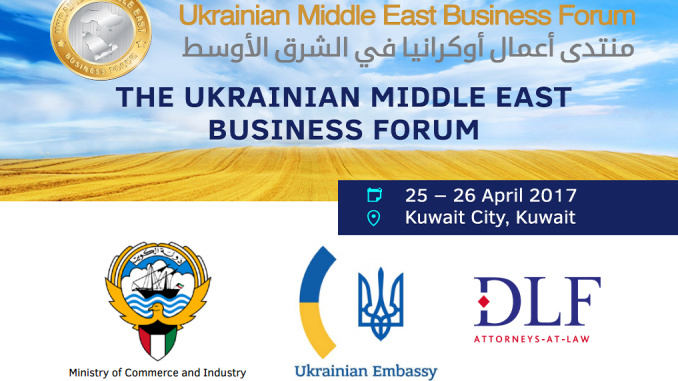 The Ukrainian Middle East Business Forumwill be held on April 25-26 in Kuwait City, Kuwait. The Business Forum is organized under the patronage of the Ministry of Commerce and Industry of the State of Kuwait and the Embassy of Ukraine in the State of Kuwait in order to bring together investors from the Middle East and Ukrainian companies. The event is aimed at building strong business connections between the countries of the Middle East and Ukraine, facilitate investments and export of goods. Among the speakers of the Ukrainian Middle East Business Forum are the Extraordinary and Plenipotentiary Ambassador of Ukraine to the State of Kuwait and a representative of the Ministry of Commerce and Industry of the State of Kuwait. The representatives of DLF attorneys-at-law, a Ukrainian law firm and the co-organizer of the Forum, will also give a speech on the key aspects of investing and doing business in Ukraine. The programme of the Forum includes one day for networking, when the Forum participants will be able to hold B2B meetings with potential partners and establish firm business connections. Meet businessmen from Saudi Arabia, the UAE, Kuwait, Qatar, Bahrain, and Oman (total population of over 51 million people). Business representatives from the Middle East Countries (Gulf Countries): top managers, including executives of IPO companies, retailers, bankers, etc. Target audience: businessmen willing to invest in Ukrainian companies and/or looking to import Ukrainian goods. High-level event: the Forum is organized under the patronage of the Ministry of Commerce and Industry of the State of Kuwait and under the support of the Embassy of Ukraine in the State of Kuwait. An opportunity to present your business at the exhibition within the framework of the Forum. Networking: your company area at the Forum for B2B meetings.